Paprika is used to garnish many foods we prepare. Like soups and deviled eggs, also for flavoring potato and pasta salads. It is also used in BBQ. Most of the prepared seasonings that are store bought for marinating meats have paprika in it. The paprika we are accustomed to using is the sweet Hungarian paprika. Paprika comes from the pods of Capsicum annuum peppers that are dried and crushed to form the powdery spice. The sweet red chili peppers are originally native to North and South America. But today, most paprika comes from Spain, South America, California and Hungary. Besides the sweet Hungarian paprika that is commonly used , there is the Spanish Hot paprika or smoked paprika. Dose it make a difference in your recipe the use of paprika (the classic sweet) to smoked paprika? Yes it does matter. Most recipes use the sweet paprika that we reach for in our spice cabinet. It is derived from the sweet red chili peppers and labeled “paprika”. But smoked Spanish paprika requires the peppers be smoked, usually with oak wood, prior to processing. Smoked paprika has a distinct flavor after being smoked. As an example smoked paprika is essential for Mexican chorizo sausage. If you used regular paprika, the chorizo would not taste the same. Paprika as for any spice has a two fold purpose when we use them. One side is the flavor spices give to our recipe and the other side is for health reasons. Any spice including paprika when consumed stimulates enzymes in our digestive system to fight off inflammation as will as bad bacteria, just to name a few good healthy reasons. If you are interested in making your own home-made Smoked Paprika click here to find out how: How to Make Smoked Paprika. 1/4 cup olive oil + 2 tsps. In a frying pan over medium heat, warm 2 teaspoons of oil. 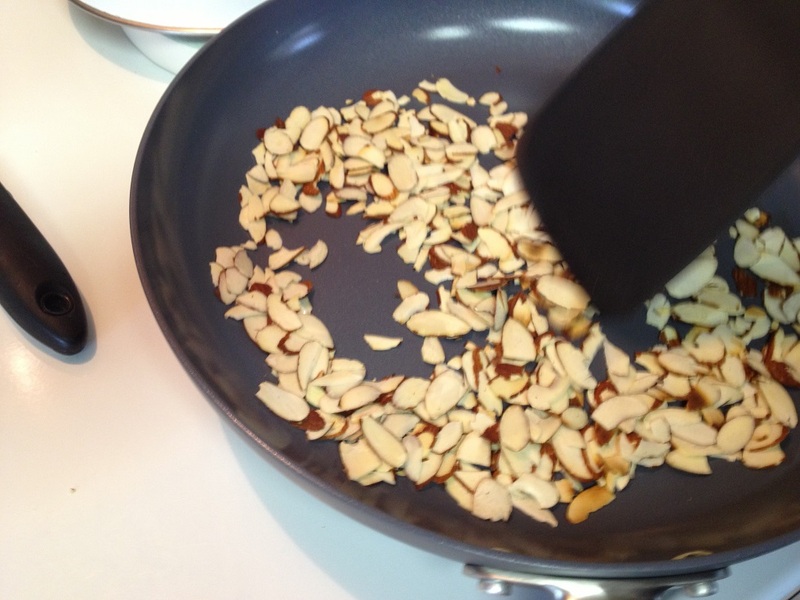 Add the almonds and toast, stirring until they are crisp and golden. This should take about 5 to 7 minutes. When you start to smell them toasting, remove the pan from the burner. If you continue to toast them, they will burn. 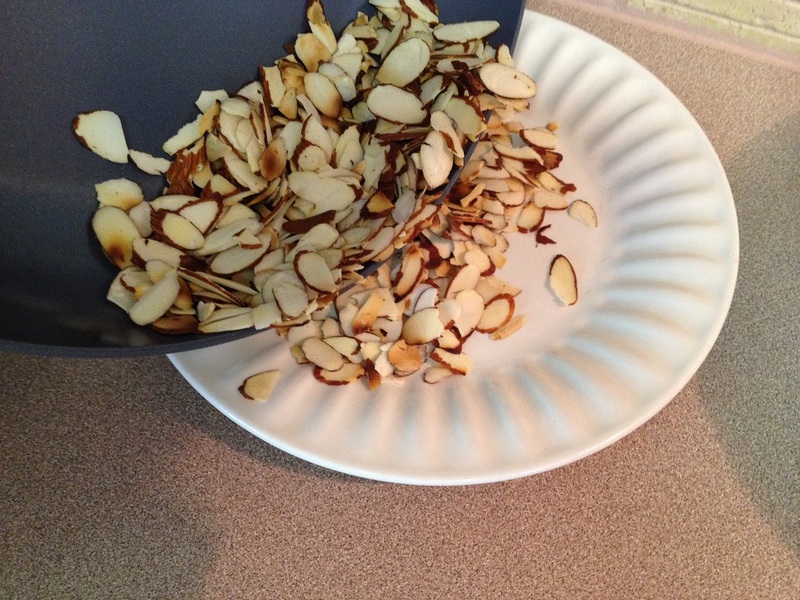 When you remove them from the burner, transfer them to a plate and set aside. To prepare the chicken breast, pour one cup of chicken broth and one cup of water into a medium stock pot. Place 4 chicken breasts into stock pot and cook on medium heat until the chicken has reached an internal temperature of 165 to 170 degrees. Remove from pot, set aside and let cool. Once cooled chopped chicken into 1 inch chunks. 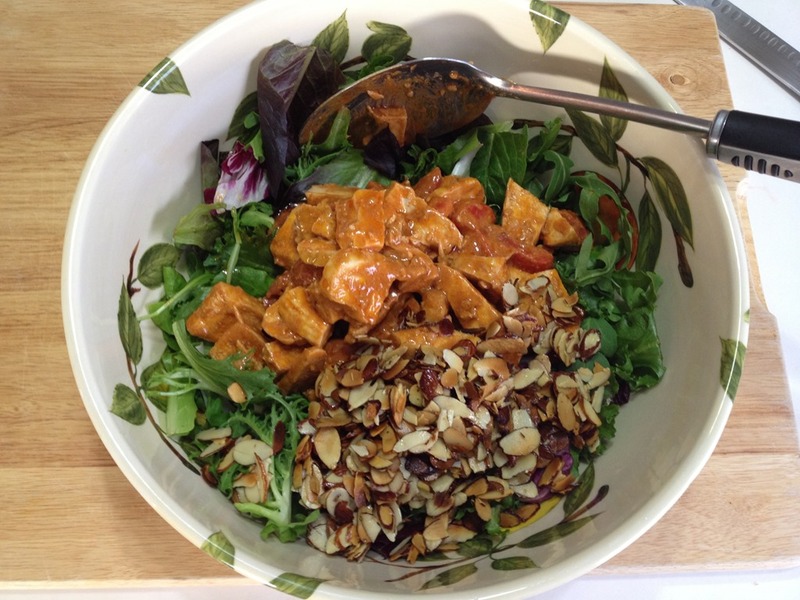 In a large bowl, whisk together the garlic, smoked paprika,vinegar, mayonnaise and option 1/2 tsp. salt, pinch of pepper. 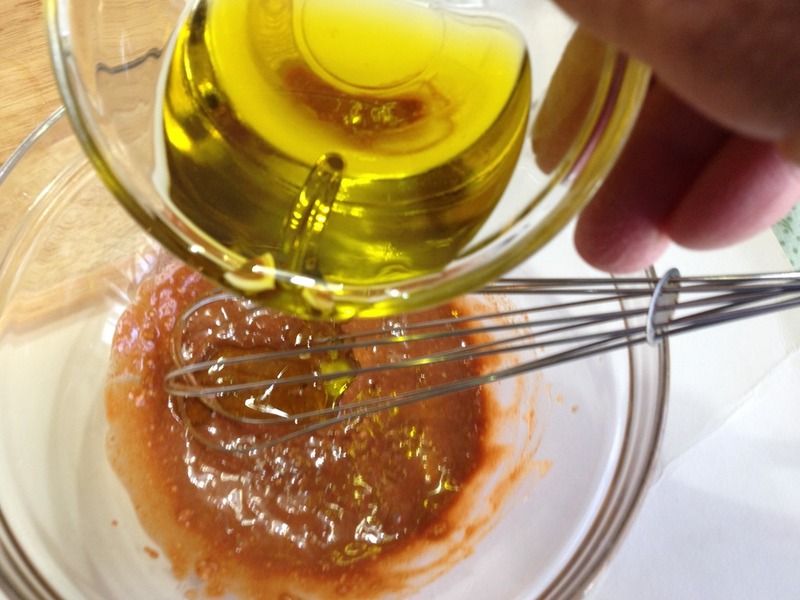 Gradually whisk in the 1/4 cup of oil and mix up until well incorporated. 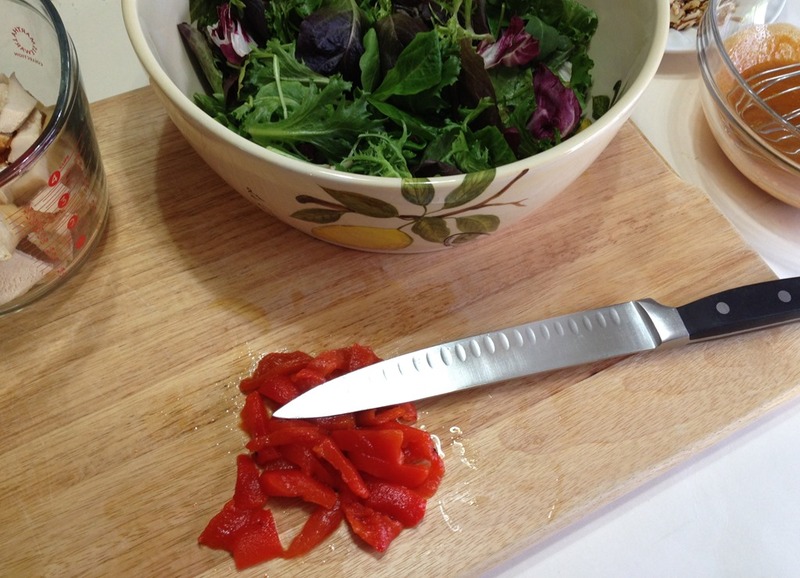 Slice the roasted red bell pepper and set aside. 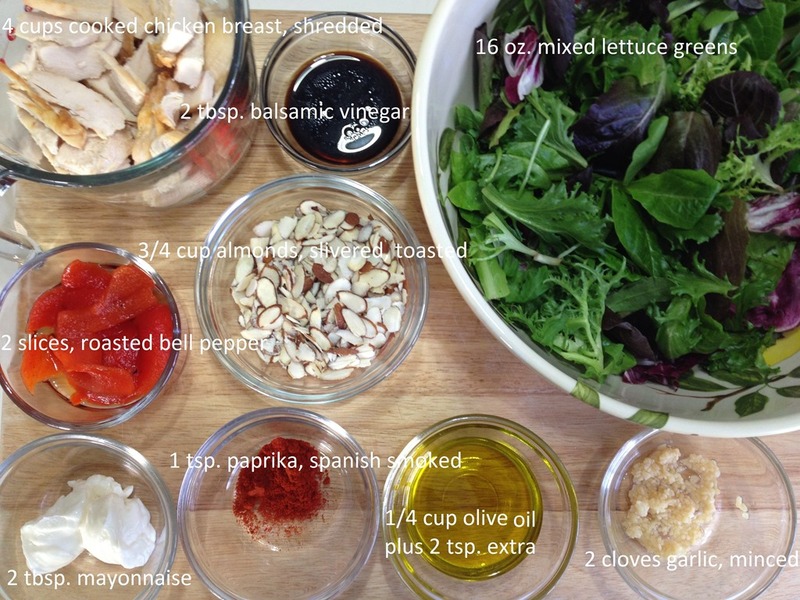 In the bowl with the vinaigrette add the chicken, and roasted bell peppers and stir to coat evenly. You can plate to the side some shredded Jack cheese and sliced roasted bell pepper, for extra toppings. 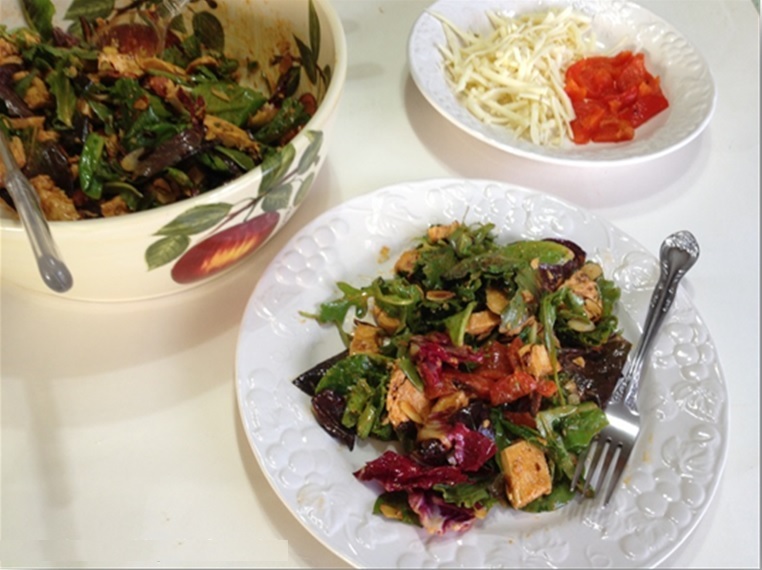 This entry was posted in Salads as a Main Course and tagged Barbecue, Bell pepper, Capsicum annuum, Chili pepper, Paprika, red chili peppers, Smoked Paprika, South America, Spain, Spice, sweet Hungarian paprika. Bookmark the permalink. I never knew the difference between the types of paprika. Thanks! Same here when I prepared this recipe! Thanks Jackie for stopping by and commenting. Have a great weekend!